Can the next generation afford to buy? Short answer: not so much. That's one of the not so surprising conclusions from a recent Fed study. Income has not kept pace with real estate appreciation while the cost of higher education has continued to rise. 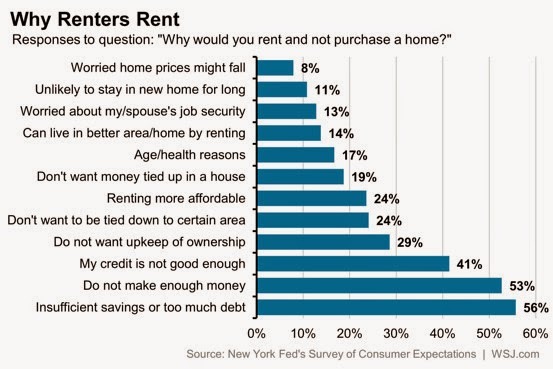 Meanwhile, the majority of people - including most renters - think buying is a smart idea. 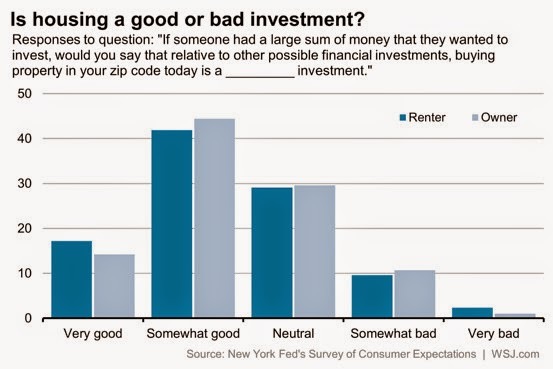 Around three in five respondents think that buying a home in their ZIP Code is a good investment, compared with one in eight that think it’s a bad one. “Current renters are as bullish on housing as current owners, or perhaps even slightly more so,” the authors conclude. Renters expect prices to rise at a slightly faster pace than owners over both a one-year and a five-year horizon. Renters can't afford to buy, too much debt not enough income. Here's something that may surprise you. The majority of Boulder residents do not own their own homes. Renters hold a slight majority over owners in Boulder. Keep in mind that nearly 44% of Boulder is also under the age of 25. We're a college town. There are currently about 32,000 students who attend CU. Fun fact: Fewer than 20,000 ballots were cast in the last City Council election (2011). Suzanne Jones received the most ballots in her favor, with 12,933 votes. Like this analysis? Subscribe to my research. Ready to buy or sell? Click HERE to schedule an appointment or call 303.746.6896.